Green washing = Public relations designed to convince people that biotech, genetically modified foods and agricultural chemicals, are environmentally friendly. Poor washing = Efforts to convince people we must accept a program such as genetic engineering to increase yields to end hunger, reduce costs, and improve livelihoods of farmers and poor people. Poor washing has created calls for a “new” Green Revolution, especially in Africa, although there is little evidence that genetic engineering and agricultural chemicals, or moving farmers off their land, will realize any of these claims. There is mounting evidence of genetic engineering doing serious harm. Forcibly displaced populations always suffer harm. In June 2008, the United Nations held a High-Level Conference on Food Security that gained much prominence in the midst of the food crisis and became a key venue to promote genetically engineered food as a solution to world hunger. Despite the overwhelming opposition to genetic engineering and chemical-input based agriculture, the biotech industry—with assistance from rich donor nations, multilateral institutions, and the philanthropic community—has used the food price crisis to gain support for GM crops. The result of the biotech industry’s well-financed publicity blitz based on “green washing” (biotech is environmentally friendly) and “poor washing” (we must accept genetic engineering to increase yields to end hunger, reduce costs, and improve livelihoods of farmers), have been calls for a “new” Green Revolution, especially in Africa. … AGRA is the biggest grantee of the Gates Foundation. With over $262 million committed, AGRA is poised to become one of the main institutional vehicles for changing African agriculture. Lutz Goedde, another hire from the biotech industry, is the former CEO and President of Alta Genetics, and is credited with making Alta the world’s largest privately owned cattle genetics improvement and artificial insemination company. All three are working for the Gates Foundation, funding projects aimed at the developing world. No African farmers, none, have been consulted for the foundation’s agricultural strategy. None of the reviewers or the external advisory board members is a farmer from Africa. People in Africa are taking action and speaking out. Members of FoE Africa from Ghana, Togo, Sierra Leone, South Africa, Nigeria, Mauritius, Tunisia and Swaziland met for five days in Accra, Ghana reviewing issues that confront the African environment. A particular focus was placed on the current food crisis and agrofuels on the continent. 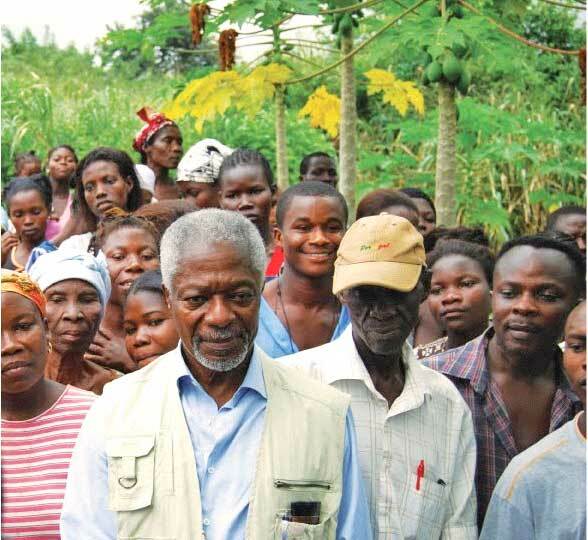 FoE Africa groups deplored the characterization of Africa as a chronically hungry continent; and rejected the projection of the continent as an emblem of poverty and stagnation and thus as a continent dependent on food aid. FoE Africa reiterated the fact that the agricultural fortunes of the continent have been dimmed by externally generated neoliberal policies including Structural Adjustment Programmes imposed on the continent by the World Bank, IMF (International Monetary Fund) and other IFIs. FoE Africa expressed disgust at the manner by which the burden for solutions to every crisis faced by the North is shifted onto Africa. Examples include the climate change and energy crises wherein the burden has been inequitably placed on the continent. Africa is forced to adapt to climate impacts and she is also being targeted as the farmland for production of agrofuels to feed the factories and machines in the North. 1. Africa contributed very little to climate change and the North owes her an historical debt to bear the costs of adaptation without seeking to further burden the continent through so-called carbon finance mechanisms. 2. Africa must no longer be used as a dumping ground for agricultural products that compete with local production and destroy local economies. 3. Africa must not be opened for contamination by GMOs through food aid and/or agrofuels. 4. Africans must reclaim sovereignty over their agriculture and truncate attempts by agribusiness to turn the so-called food crisis into money-making opportunities through price fixing, hoarding and other unfair trade practices. 5. We reject the promotion of conversion of swaths of African land into monoculture plantations and farms for agrofuels production on the guise that some of such lands are marginal lands. We note that the concept of marginal lands is a cloak for further marginalizing the poor in Africa through their being dispossessed and dislocated from their territories. 6. Africa has been subsidizing world development for a long time and this has to change and African resources must be used for African development to the benefit of local communities. FoE Africa calls on all communities of Africa to mobilize, resist and change unwholesome practices that entrench servitude and exploitation on our continent. Monsanto is a chemical company posing as an agricultural company specializes in toxic, dependency-creating, genetically-engineered crops and pharmaceuticals. Monsanto is one of the world’s most notorious multinationals that has been caught red-handed for bribery, false studies and evaluations, and paying off scientists for favourable reports. It has been responsible for over 10,000 farmer suicides and thousands of poisoned sheep in India alone. Its GE products are banned in countries including in Europe after painful experiences. Terminator technology refers to plants that have been genetically modified to render sterile seeds at harvest – it is also called Genetic Use Restriction Technology or GURTS. Terminator technology was developed by the multinational seed/agrochemical industry and the United States government to prevent farmers from saving and re-planting harvested seed. One of the top cotton-growing areas in India is Madhya Pradesh. It has a rich black soil, perfect for cotton. In 2002 farmers were persuaded to use BT cottonseed. — Some 10,000 acres were planted with it — although official permission had not been granted till then. The farmers ended up with 100 per cent failure. Due to the drought, indigenous cotton varieties had also been negatively affected but their ‘failure’ accounted for only 20 per cent of the crop, not all of it. Furious farmers demanded compensation from the company that supplied these seeds. That was Mahyco. And where did Mayco get these seeds from? – From Monsanto, the US multinational chemical giant which had a 27 percent share in Mahyco. … reports emerged, confirmed by a Gujrat khadi institute, of allergies not only among farmworkers but also itching and rashes in people wearing clothing made from Bt Cotton. Even when farmers found the seed to be four times as expensive, they felt it was because of ultimate economy, and even went into debt to buy the input package. There were other problems. Bt cotton requires 20 percent more water than other hybrid cotton which needs more water than traditional varieties to begin with. No one said anything about Bt cotton being drought resistant. The truth was that Bt cotton was unable to adapt to stress conditions. It was criminal to encourage Bt cotton in drought-prone areas – and not telling farmers about this drawback in Bt cotton. The rains failed to come in some districts. Farmers were ruined because they had not grown the local hardy species that had evolved to withstand drought conditions with minimal loss. That was not all. There was serious oversight on the part of Monsanto scientists. Wouldn’t it be common sense to deduce that if the Bt cotton plant was poisonous to bollworms eating it, it could be poisonous to other living creatures too? After the harvest, sheep were allowed to graze on the harvested fields to eat the crop residues, a common practice worldwide wherever natural farming is pursued. In just four villages in Andhra Pradesh, 1800 sheep died horrible, agonising deaths within 2-3 days from severe toxicity. More deaths were reported in other areas. The word was quickly spread to avoid grazing sheep where Bt cotton had grown. It meant less fodder and greater expense for the sheep-owners. Farmers in 3rd world countries are being sold these patented seeds. The crops were planted by illiterate farmers, for whom, even if they could read, the information on the packaging would be worthless, it was in English only. That information would have told them that these crops would need irrigation, and shouldn’t be used in rain-fed farm lands. The crops would also need pesticides and fertilizers, again from Monsanto. These crops failed, leaving the farmers further in debt, to surprise, the company store: Monsanto. Since these seeds are patented, the farmers are forbidden from saving seed from one year to the next, selecting the healthiest traits for the next season. New seeds must be purchased. The in-debted farmer’s land is then seized by Monsanto, which compounds the debts. Now hopeless in their situation, the farmers are committing suicide. Many thousands of farmers in India have committed suicide. Farmers in one of Kenya’s largest grain-producing areas have been cultivating genetically modified maize that is potentially harmful to human health without knowing it. The Sunday Nation can exclusively report that the relevant seeds are sourced from a South African company that is a subsidiary of Dupont, a leading US-based biotechnology firm. This was revealed to the Sunday Nation by officials of the Kenya Biodiversity Coalition (KBioC), a body that brings together 45 farmer groups, NGOs and civil society bodies. After tests, it was conclusively established that the sample was contaminated with traces of MON810, a genetically modified maize variety owned and marketed by Monsanto, an American biotechnology company. The revelation confirms long-running suspicions among many Kenyan farmers that they could have been cultivating genetically modified varieties of maize without being aware of it. “Initially, we were given the suspect seeds as donations by politicians and we planted them. But when we harvested, the maize started rotting almost immediately,” said Isabel Wandati, a farmer and official of a women’s group in Butere. She laments that she finds it impossible to replant the same maize and blames the Kenya Bureau of Standards for not properly inspecting the relevant maize variety. She adds that instead of arming farmers in Butere with the relevant information on the variety, the local agricultural extension officials have been championing its cultivation. There is now a danger that the country’s entire maize crop could be contaminated with traces of MON810. This is because maize is a cross-pollinated crop and pollen that bears traces of MON810 might be transported by wind from contaminated farms into uncontaminated ones. The variety is patented by Monsanto and is banned in several European countries because of its negative impact on the environment and its harmful consequences on such useful insects, such as butterflies and bees. Research conducted in some European countries had shown that feeding mice on the variety damaged their kidneys and livers. However, its effects on humans is yet to be fully studied since maize is generally not used as human food in Europe and America. It is instead fed to horses and other domestic animals. Once the country’s maize crop is contaminated with genetically modified varieties, Kenya risks losing traditional hybrid varieties that were painstakingly developed by KARI at the taxpayer’s expense. Genetically modified grains are injected with bacteria that produce poison to kill nuisance pests and resist adverse weather conditions. However, these poisonous bacteria have the downside of potentially destroying the soil by killing helpful bacteria and insects. Also, they compromise food safety and might prove to be harmful to humans over time once the grains are consumed. In fairness to Monsanto, I don’t think it is only African agriculture they wish to colonize and control. I think it is the whole world. But the complicity of governments promoting the use of these seeds needs to be checked. Kenya’s entire maize crop is at risk, and may already be contaminated. The farmer’s words are most worrisome “Initially, we were given the suspect seeds as donations by politicians and we planted them. But when we harvested, the maize started rotting almost immediately” and that: She laments that she finds it impossible to replant the same maize. This sounds like they may be using terminator seeds. The plants are genetically engineered so that the seeds are sterile, forcing the farmers to buy new seed each year, rather than save and plant seeds from the previous crop. Populations are exposed to famine just because they may not have money to buy new seeds. Lives are dependent on the seed vendor. The vendor, or government sponsor, can trap the farmers in a cycle of debt, pricing seeds so that the farmers are forced to borrow each year in order to plant, and never escape debt. GM, genetically modified, seeds can cross pollinate and contaminate non GM crops. 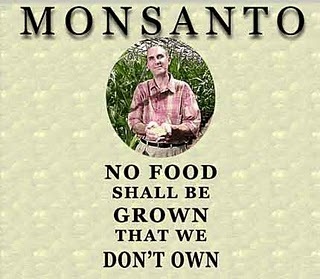 Supposedly to prevent this, Monsanto has developed seeds that are sterile. Unfortunately they can still cross pollinate. The resulting seeds can’t grow, which is an additional contamination. The seeds that have been genetically modified not to grow are called terminator seeds. In the past I have been skeptical of the people crying about GM foods. I have wondered if some of the fear was more superstition than science. The more I read, the more I realize there are serious reasons to be wary and skeptical of GM food. Even contained experiments have cross polinated outside of their contained zones. The west needs to do its research and experimentation at home. And it needs to provide some conclusive evidence of safety IF the seeds are safe. One friend says that “I’m sorry” is the white man’s national anthem. He cuts off your brother’s head and then says “Oh, I’m sorry”, and you are supposed to take it. It looks like the US is trying to colonize Africa militarily with AFRICOM, and colonize it agriculturally as well, with GM seeds and biofuel plantations. While this is not necessarily about race, there is a racial component. “I’m sorry” later on will not compensate for the suffering and destruction caused by these hugely mistaken approaches to the continent. As another friend of mine used to say: Don’t be sorry, be careful.